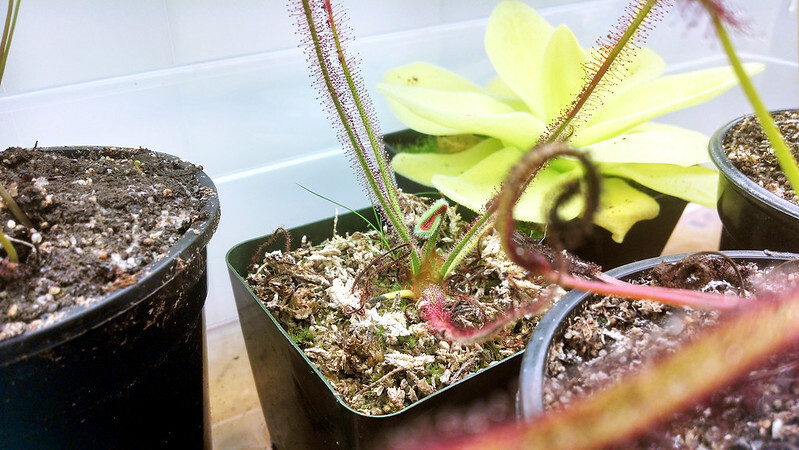 Drosera 'Marston Dragon' gets a haircut |Sundews Etc. 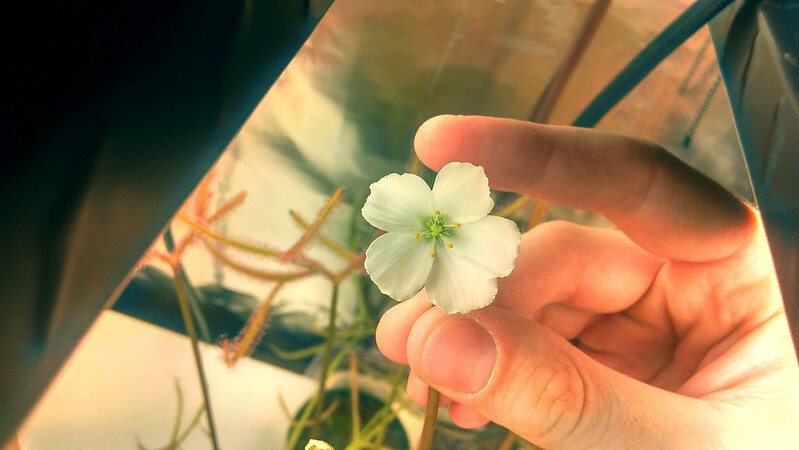 I caught an open flower on my Drosera 'Marston Dragon' today, and it's a beaut. A strikingly large Drosera 'Marston Dragon' flower. The D. 'Marston Dragon' is a bit more tidy now. I've trimmed off all of the old growth, which had gotten quite floppy and was looking pretty ragged. The new growth is nice and upright, and much neater. Something for the compost pile that I don't currently have but need to establish. 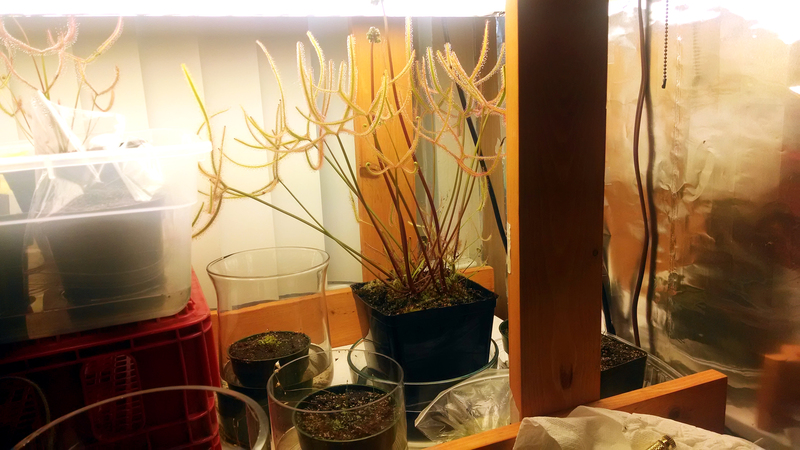 I also took the time, right after the above photos were taken, to harvest the other, somewhat younger flower stalk for cuttings. I think I'm just going to let the one that is blooming bloom. 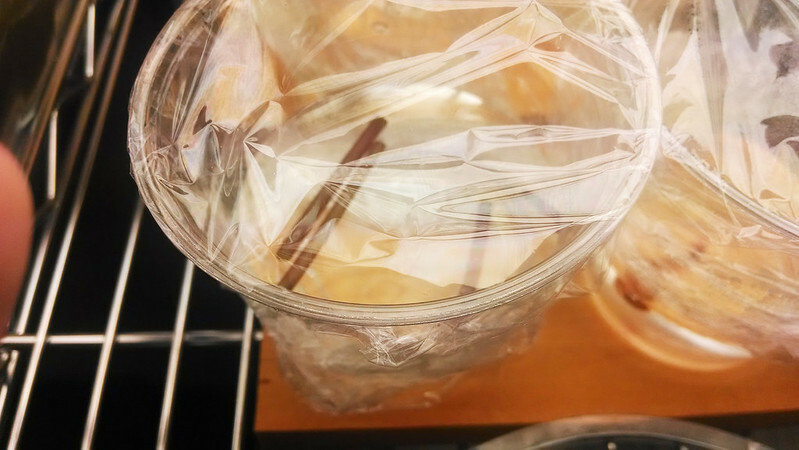 I split the stalk between a pot of media I had already prepared, and a cup of water under the lights. 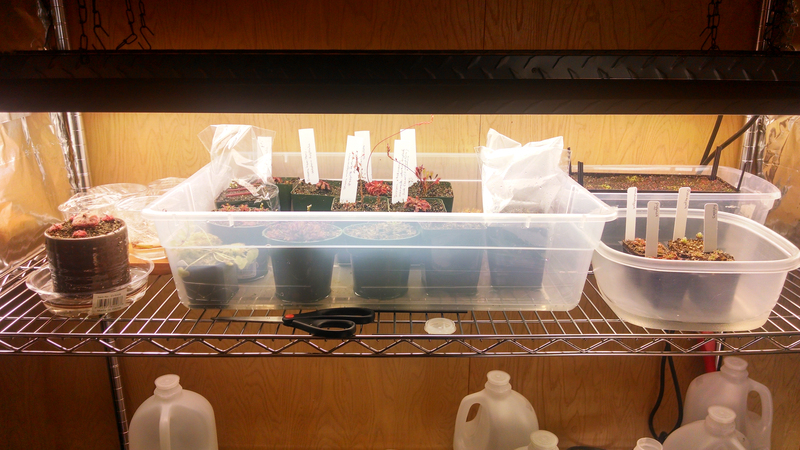 We'll see how the respective cuttings fare long term. D. 'Marston Dragon' flower stalk cuttings on a pot. D. 'Marston Dragon' flower stalk cuttings out of focus in a cup of water. Of course, this means space is beginning to get tighter under my new lights, even though I only bought them a month ago. The new tray filling up really surprisingly quickly. Well it's not like I regret having plants. The next set of lights I get will be for a dedicated propagation area – I'd like to get more serious about propagation, now that I have a bit of experience under my belt. Just as a brief aside, it seems my Drosera spiralis has weathered the heat of the past week fairly well – it's still looking strong, and is putting out a new leaf. The distinctive curl of an unfurling D. spiralis leaf. It's nothing definitive, but I'm glad it hasn't croaked on me yet! Are you throwing away all of leaf cuttings? 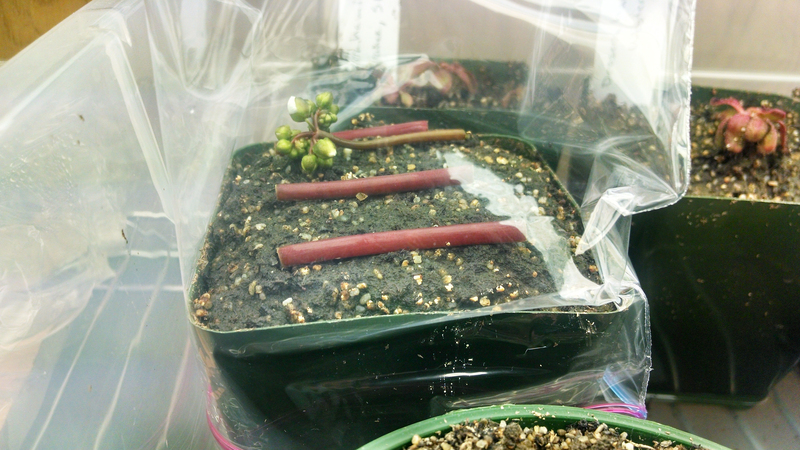 Isn't it possible to propagate them with those, like for Drosera filiformis? I just don't have enough media prepared and I don't have room for them. I've already done one round of leaf cuttings and have started some flower stalk cuttings, so these are just gonna get tossed. 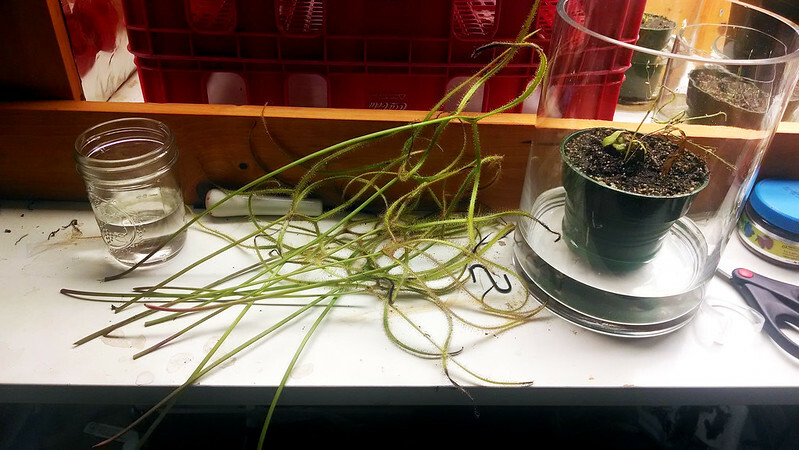 How's your D. filiformis cutting going? Any strikes yet?